Business users are a key part of a company's security, and even the most conscientious employees can introduce serious breaches of security policy. IT can do everything in its power to secure the company's confidential documents--provide first-class security infrastructure, develop reasonable security policies and engage in extensive communication and training--yet still people fail to comply. 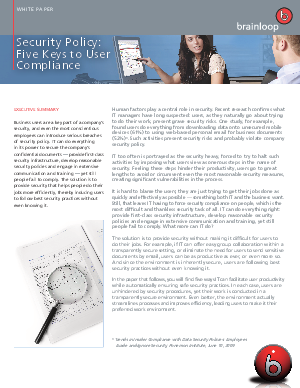 The solution is to provide security that helps people do their jobs more efficiently, thereby inducing users to follow best security practices without even knowing it.